goodbye summer. harro fall. totally loving your brisk evenings. this summer salad is essentially another version of this one. 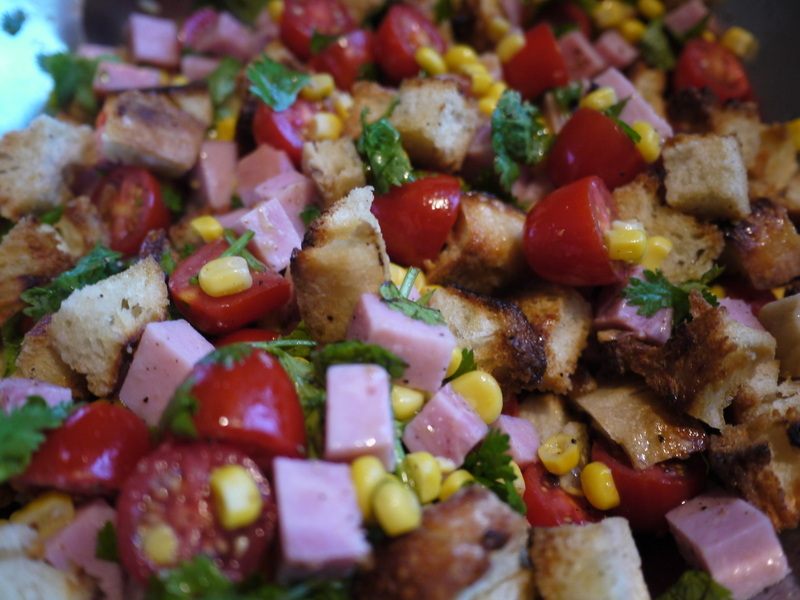 instead of shrimp and okra, i used diced ham and toasted & cubed garlic bread [which make it crunchy like croutons]. add chopped cherry tomatoes (halved), 1 can of sweet corn kernels, chopped cilantro, 1 tablespoon of lemon juice, and 2 tablespoons of EVOO. DONE. like i also noted in the previous post, this dish is super easy and fast to make and would make for an excellent potluck dish. i’m pretty sure my mom is going to make this for her ladies potluck next weekend. cute.